Racing interviews are usually too polite and vague. Not so with No. 62 Scuderia Corsa driver Townsend Bell. Bell told Fox Sports all about his thoughts on the huge LMP2 class at the 24 Hours of Le Mans this year. Spoiler alert: he’s not fond of how some of them drive. ﻿As David Hobbs once said at Daytona, this kind of race has some of the best drivers in the world—and also has some of the not so great drivers. A lot of them are in the [LM]P2 class, I’ve discovered. It’s a bit like giving a drunk guy an AK-47 that has no training and say “have at it” because there’s some crazy, crazy stuff going on. They’re slow, but wild, and it really effects—you know, it’s all about average lap time. You’re out there, you’re just trying to...get every little hundredth of a second lap after lap and some of those [LM]P2 cars can really throw you off your rhythm. Bell then proceeds to make AK-47 gestures with his hands as he walks away. He’s not exactly wrong, either. 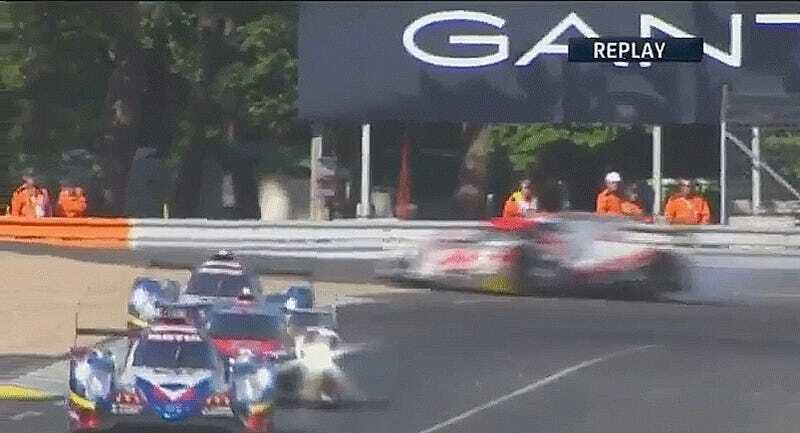 If there is an on-track incident during this running of Le Mans, it’s frequently been some jabroni LMP2 driver nosing into the wall, losing it into the gravel or making avoidable contact. To wit: the G-Drive LMP2 team destroyed more noses than they had spares, so they had to borrow one of the Dragonspeed team’s noses to repair one of their cars with over seven hours left in the race. That’s right: these cars have crashed so much that they’re starting to run out of spares. In previous years, I’ve said “it’s always a Ferrari.” Ferraris are popular endurance racing cars, and with more of them on track, there’s a higher probability that the latest ham-fisted feat of bad driving happened to be in one of many Ferrari GT race cars on track. This year, though, it’s definitely always an LMP2. There’s a lot of them, they’re fast and it’s a class open to drivers classed as “amateurs.” Want to race a prototype? Buy your way into LMP2. Hilariously, because all but one of the fastest LMP1 cars has either retired or lost a lot of time to a major mechanical issue tonight, an LMP2-class car will probably make it onto the overall podium. Some of these teams may be wrecking balls on wheels as Bell described, but others are really fast. Honestly, I’m rooting for Jackie Chan DC Racing at this point, as Chan and I share a deep appreciation for fast Mitsubishis. Don’t le me down, Jackie! That’s my team now! This isn’t the only time a driver’s gotten straight to the point with an interviewer tonight. No. 90 TF Sport Aston Martin driver Rob Bell’s comment to the WEC commentary team that No. 51 AF Corse Ferrari driver James Calado “had his head up his backside” when he rear-ended Bell’s car earlier in the race made me chuckle. 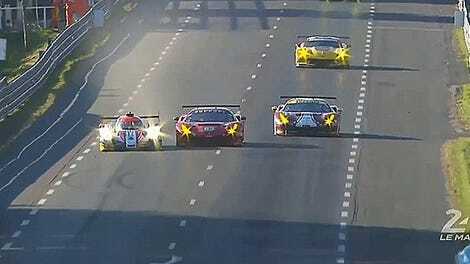 Bell and Calado aren’t even in the same class, and LM GTE Pro driver Calado rammed into the trunk of the No. 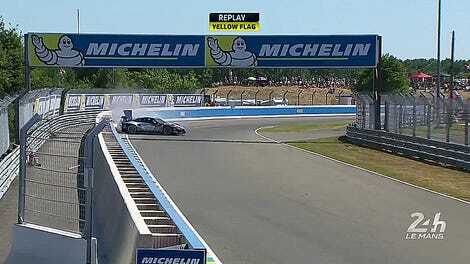 90 when he didn’t expect the LM GTE Am-class Aston to brake earlier.